MyFirmsApp, the global number one developer of custom Apps for Accountants and Bookkeepers, is celebrating being named as a finalist for the first time the highly sought after British Excellence in Sales Management (BESMA) Awards. The company has been shortlisted in the ‘Customer Service Team of the Year’ category. Organised by the Institute of Sales Management, the BESMA awards are recognised as one of the sales industry’s top accolades with the standard of entries always exceptionally high. Roger Bradburn, COO, Institute Sales Management, described the standard of entries this year as ‘formidable’. This is an important achievement for the MyFirmsApp team as being shortlisted for such a prestigious award helps to recognise the level of passion and dedication that underlies all its interactions with the 1000 accountancy firms that have a custom App developed by the company. Glen Herrington heads up the team and is committed to ensuring customers receive excellent support and customer service with no ticket system or queues, 24 hours a day and enabling customers to communicate any time in the way they want support. 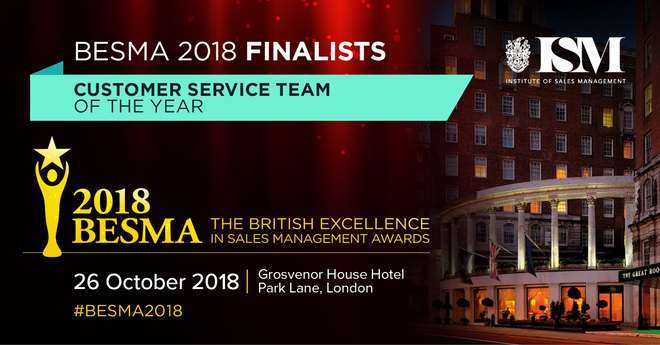 The BESMA Awards are in their 12th year and they seek to reward the efforts of individual sales professionals and teams in driving company performance, as well as recognising the key role of sales in creating a thriving UK economy. The MyFirmsAppteam will find out if they have won the title of Customer Service Team of the Year at this year’s Awards ceremony, which is being held at the Grosvenor House Hotel, Park Lane, London on the 26th October. It is the opportunity for the sales profession to come together for an evening of fun and celebration and to reflect on some of the fantastic achievements of the companies, teams and individuals in the sales profession and the overwhelmingly positive impact that the sales industry has on has on the business world and the people who work with in it.